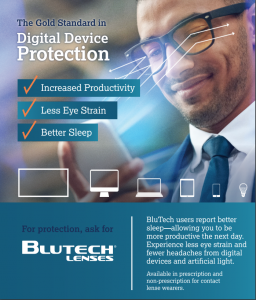 BluTech lenses improve contrast, clarity, visual acuity and night vision and most importantly improve your quality of sleep. Overexposure to blue light may put you at risk for: Sleep problems, eye strain, headaches, migraines, and macular damage. BluTech Lenses filter blue light via a unique, patented combination of Ocular Lens Pigment and melanin. No other clear lens filters more of the damaging blue light known to be associated with blur, glare, macular damage, and sleep cycle disruption without distorting color.